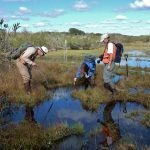 This website was developed by a small group of wetland scientists working for the North Carolina Division of Water Resources who are dedicated to learning more about the wetlands in North Carolina, sharing that information, and working to protect against and restore wetland loss. The team consists of ecologists (Amanda Mueller, Kristie Gianopulos), a geologist (Greg Rubino), environmental educator (Lacey Frownfelter), and graphic designer (Sam Cox). 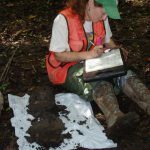 Additional input was sought, when needed, from experts within the NC Department of Environmental Quality, NC Department of Public Instruction, NC Department of Cultural and Natural Resources, and others. 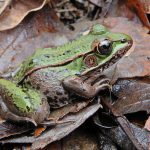 We strive to provide excellent information centered on North Carolina’s wetlands, presented in a compelling way. 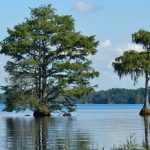 This website contains information about what North Carolina’s wetlands look like, North Carolina’s publicly accessible wetlands, past and ongoing research by the NC Division of Water Resources on North Carolina’s wetlands, laws governing North Carolina’s wetlands, and ways everyone can help wetlands. 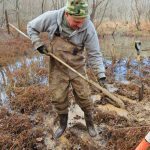 The website aims to be an excellent useful resource of accurate, understandable, and interesting information concerning North Carolina wetlands. This website was developed primarily during 2018, with later additions as noted. Information in this website is focused on the wetlands of North Carolina located in all parts of the state, from the mountains to the coast. It is hosted by the North Carolina Division of Water Resources and located at www.ncwetlands.org. This website can be cited as: NC Division of Water Resources. 2018. North Carolina Wetlands Information. http://www.ncwetlands.org. Published by the North Carolina Division of Water Resources. Water Sciences Section. Because North Carolina’s wetlands are awesome and everyone needs to know about them! This project was funded from 2016 to 2019 by EPA Region IV Wetland Program Development Grant Cooperative Agreement CD00D51216.